What is special about SMOE? A TEIK representative will recommend you to a hiring manager for the SMOE program who will then arrange a phone interview to ask you routine questions and they will also answer questions that you might have about the program. In order to arrange a job interview you will need to provide the items below. F. Available phone number and range of time that SMOE can call you. You need to send the required documents to the hiring manager (recruiter) so SMOE can finalize your application. Once you are accepted by SMOE you will be able to apply for your visa with NOA (Notice of Appointment) and final copy of contract. 3. Issuance of NOA and Final copies of contract. SMOE will issue NOA and two final copy of contract for your visa application and these documents will be sent to your home address by DHL. * Home address on application should be accurate and available. SMOE does not re-issue these documents a second time and your application will be automatically canceled if you do not receive these documents at the proper address. Book your flight and send your full flight itinerary to your recruiter. SMOE will pay 1.3M KRW cash for your flight regardless of your flight cost so you better find the cheapest flight so you can save yourself some money! Arrival date will be announced by SMOE and your TEIK representative will inform you when you arrive at Incheon airport. Once you arrive at Incheon airport, a TEIK representative will guide you to take a shuttle bus for your orientation. Orientation usually takes about 7~10 days and all of the SOME applicant's placements will be announced during this orientation. Medical test (including TBPE and HIV test) will be done during orientation and applicant must pay for this medical examination. Your employment starts from the first day of teaching at the school and you may need to show your employment contract as well as "Residency certificate" for your free income tax. Government public school teachers can have first two years of income tax exemption according to Double Taxation Agreement. The duties of the Native Speaker English Teacher (hereinafter "NSET") are carried out under the guidance of the supervisor designated by Seoul Metropolitan Office of Education (hereinafter "SMOE"). Conducting English classes in cooperation with Korean homeroom or English language teachers. Preparing teaching materials and activities for English language education. Assisting with the development of teaching materials related to English language education. The SMOE program will decide placements accordingly and participants will work at elementary and middle schools within Seoul, but some may be designated to work at other educational facilities within the SMOE system. Rejection of placement may result in disqualification from the program. - Have completed two full academic years or more at an accredited college or university. - Be a citizen from a country where the primary language is English. ∗ Canadian citizens from the Quebec Province and countries where English is a co-official language and/or applicants from non-English language backgrounds whose first language is not English must have been taught in English-language schools from junior high school to the university level. - Be fluent and proficient in the English language grammar and structure and be able to communicate fluently with clear and have distinct pronunciation. - Be mentally and physically capable of performing the specified responsibilities and duties. Must also have the ability and willingness to adapt to Korean culture and living. - Meet the criteria of eligibility for E2 (work) visa set forth by the Korean Immigration Authority. * Aged 50 or over (As of 2008. 12. 31) may be excluded from the selection due to the purpose and the aim of SMOE. • Salary ranges from 1.8-2.7 million won (approx. US$ 1,800 ~ $2,700 per month based on $1:1,000KW exchange rate), depending on level of experience:. Level H: 1.8 million won per month: A Bachelor's degree from an accredited university in one of major English-speaking countries with the instructions taught in English. Level G: 2.0 million won per month: Must have one of the following qualifications: A valid teacher certification for either elementary or secondary level schools. A Bachelor's degree in Education. A Bachelor's degree in English, English Education, English Literature, or Linguistics. A TESOL/TEFL or an English Teaching Certificate comprised of a minimum of 100 course hours. A Master's degree. A Bachelor's degree with at least ONE (1) full year of English teaching experience at accredited institutions. Level F: 2.2 million won per month: Must have one of the following qualifications: In addition to one of the requirements for Level G, ONE (1) full year of English teaching experience at accredited institutions including at the SMOE. A teacher certification with specialization in English Education. A Master's degree in Education. Level E: 2.3 million won per month: Must have one of the following qualifications: Meet the Level G qualification with at least TWO (2) full years of English teaching experience at accredited institutions. Employed as Level F at the SMOE for ONE (1) full year. A Master's degree in TESOL/TEFL or in English Education. Level D: 2.4 million won per month: Employed as Level E at the SMOE for ONE (1) full year.At least ONE (1) full year of English teaching experience at accredited institutions with Master's degree in TESOL/TEFL or in English education. A Bachelor's degree in English education with at least THREE (3) full years of English teaching experience at accredited institutions. A teacher certification with specialization in English education with at least TWO (2) full years of English teaching experience at accredited institutions. Level C: 2.5 million won per month: At least TWO (2) full years of English teaching experience at accredited institutions with Master's degree in TESOL/TEFL or in English education. A teacher certification with specialization in English education with at least THREE (3) full years of English teaching experience at accredited institutions. Employed as Level D at the SMOE for TWO (2) full years. Level B: 2.6 million won per month At least THREE (3) full years of English teaching experience at accredited institutions with Master's degree in TESOL/TEFL or in English education. At least THREE (3) full years of English teaching experience as a present public or private school teacher with a recommendation by the superintendent or the school principal. Employed as Level D at the SMOE for THREE (3) full years. Level A: 2.7 million won per month At least FOUR (4) full years of English teaching experience at accredited institutions with Master's degree in TESOL/TEFL or in English education. At least FOUR (4) full years of English teaching experience as a present public or private school teacher with a recommendation by the superintendent or the school principal. Applicant must fill in a SMOE application including personal essay and self medical check form. Personal Essay must be more than 300 words and TEIK recommends that you write this essay emphasizing why you would be a dependable professional teacher in the SMOE program. Resume must be formal and appropriate for applying for a public school teaching job. Education background and full time teaching experience must be clearly stated on your resume and a cover letter must be included. l Lesson Plan will be requested before a job interview. SMOE applicants must have 3~4 years BA qualification or above and applicants must provide notarized (Apostilled) copy of BA and MA diploma. Officially Sealed Academic Transcripts must be submitted and applicants must provide MA or Doctorate transcripts as well (if applicable). l Academic GPA will be requested in order to arrange a job interview with SMOE. Photocopy of Passport needs to be submitted and notarization is not necessary. A statewide criminal background check that is notarized by the state apostille. Criminal record checks are only valid for 6 months after it is issued. l Web Search Result of Criminal Record Check is not Acceptable and CRC must clearly state that "No Record" or "No record founded" on the statement. l CRC must be issued by State Police Department level or above. Local Police Clearance is not acceptable. Professional recommendation letter (original copy only). A friend or close relative cannot be a reference for the reference letter. An academic Professor or employer should issue this letter and letter must have letter head and contact information with signature on. Certified teachers must provide a notarized copy of their teaching certification and Language certificates such as TESOL or TEFL and these courses must be more than 100 hours of classwork and at least 6 hours of teaching practicum otherwise it won't effect your salary level (certificate holders can increase their pay normally by 100,000KW). You need to prepare several passport photos because you will need a few after you arrive in South Korea and you need to paste your one passport size photo on your application. TEIK will provide you a copy of the contract and you need to make three copies and every page must be signed before it sent to your TEIK representative of SMOE representative. Applicants must provide an official letter from previous employers in order to show proof of the applicant's full-time teaching experience. A copy of a previous E2 visa or a copy of a previous contract will not be acceptable and the period of employment and "full-time employee" should be stated on your letter. l Only one full year of experience will be considered as a full time teaching experience (for better salary criteria). What is special about EPIK? All EPIK GETs, regardless of level, will be provided with a settlement allowance of 300,000 KRW within the first month of their first contract. Free furnished housing or a rent subsidy will be provided by the host POE. A leased house/apartment/studio-type room as well as basic household goods will be provided by the host POE. Basic household goods include: a bed, a table and chairs, a wardrobe, a gas stove, a refrigerator, a washing machine, a microwave oven, and a TV set. Utilities and maintenance fees are not provided for and are the responsibility of the EPIK GET. 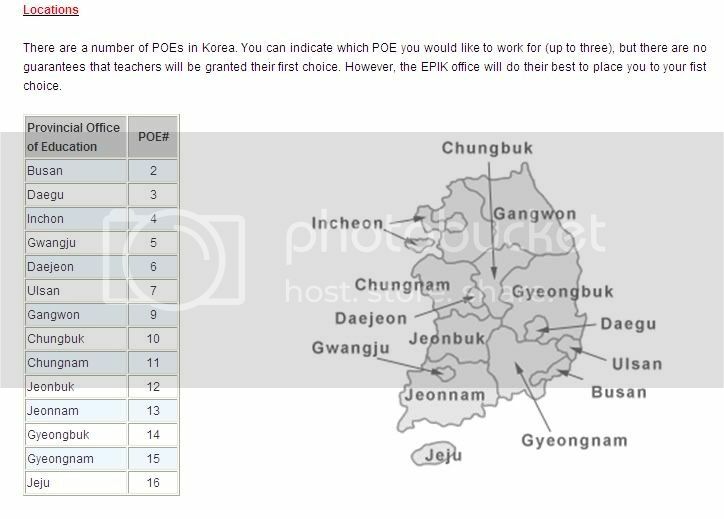 Due to variations in housing costs in different regions of Korea, the size and location of the supplied housing can vary from POE to POE. All EPIK GETs, regardless of level, who successfully complete a one-year contract, will be entitled to receive severance pay. Severance pay is equal to approximately one month's salary. Within the first month of the contract, all EPIK GETs, regardless of level, will be provided with 1,300,000 KRW of Entrance Allowance. To prevent early termination of contracts, the Entrance Allowance is issued as a form of a loan from the employer to the EPIK GET. In the event that the contract is terminated within six (6) months of its implementation, including renewal contracts, regardless of course or grounds, the EPIK GET will repay the above-mentioned loan to the EPIK office immediately. An Exit Allowance of 1,300,000 KRW is provided upon successful completion of the 1 year contract. 2,000,000 KRW will be provided upon successful completion and renewal of your contract with the same POE. In this case, the other allowances (Settlement, Entrance, and Exit) do not apply. National Pension Scheme - Pursuant to the Korean National Pension Corporation Act, 50% of your compulsory pension contributions will be paid by your host POE. Current compulsory pension contributions total approximately 9% of your salary and are payable monthly. Half of this amount, about 4.5%, will be paid by your host POE, with the remaining amount being deducted from your monthly salary. With the exception of Canadians, all EPIK ELIs, regardless of ELI level, are exempt from paying Korean income tax for the first two years of their employment in Korea. To be eligible for this tax exemption, you must submit official proof of residency in the form of Residency Certification from the relevant jurisdictional tax office of your country of permanent residence. This document must be submitted to the supervisor of your POE within one month of your arrival in Korea. In order to be tax exempted, you are required to submit documents below to your supervisor within the first month of your employment. If you have previously worked for more than two years in Korea, you are ineligible for this income tax exemption. Income tax exemption can be an exceptional benefit since, for example, in the USA, single persons with no dependents may need to pay one-third of their income as tax. As there is no tax treaty between Canada and Korea, Canadian EPIK ELIs will be taxed between 2 and 4 percent on their Korean income depending on their EPIK GET level. An additional paid two-week vacation will be provided between contracts for renewing members. Teachers complete the 1 year contract will be entitled to receive severance pay one month equivalent. Applicant must fill in EPIK application including personal essay and self medical check form. Personal Essay must be more than 300 words and TEIK recommends that you to write this essay briefly about why you would be an outstanding teacher in the EPIK program. Resume must be formal and appropriate for applying at a public school teaching job. Highlight one's education background and full time/part-time/volunteer teaching experience must be clearly stated on your resume and a cover letter must be included as well. EPIK applicant must have a 3~4 years BA qualification or above and applicants must provide a notarized (Apostilled) copy of their BA and MA diploma(s). Do not send the original. Officially Sealed Academic Transcripts must be provided and the applicant must provide MA or Doctorate transcripts as well (if it is applicable). *Note: Statewide CBC (Criminal Background Check) clearance is only acceptable. Photocopy of one's passport needs to be submitted and notarization is not necessary. Notarized (Apostilled) CBC (CRC same as CBC) criminal background check. Criminal record check is only valid up to 6 months after it is issued. l CBC/CRC Web Search Results by a private company are not acceptable and the CRC must clearly state that "No criminal record" or "No criminal record found" on the statement. Recommendation letters must be sealed and the EPIK office will open these documents when they screen applicant's documents. A friend or close relative can't issue this reference letter. An academic professor or former/current employer should issue this letter and the letters must have a letter head and contact information with a signature on it. Certified teachers must provide notarized copies of teaching certifications and or Language certificates such as CELTA, TESOL or TEFL and these courses must be more than 100 hrs to receive credit otherwise it won't positively affect your salary level (certificate holders can have a higher salary). You need to prepare several passport photos because you will need one also after you arrive in South Korea for your alien registration card. You need to paste one of your passport size photos onto your application and send two to Korea with your documents. 10. Letter of full-time teaching experience. Applicants must provide an official letter from their previous employers in order to prove an applicant's full-time teaching experience. A copy of your previous E2 visa or a copy of your previous contract(s) will not be acceptable and the period of employment and "full-time employee" should be stated in your letter. l Only one full year of experience will be considered as a full time teaching experience, so less than that will not be considered for higher pay (for better salary criteria). Why should one choose to work for GEPIK? Easy Access to Central Seoul with a wonderful subway & bus system. The population of Gyeonggi Province as of the end of 2003 was about 10,360,000 which is 21.2% of the nation's total population. The total area is 10,183? which is approximately 10% of the total land area of South Korea. Furthermore, there are 31 city and county-level local autonomous governments in Gyeonggi Province. Gyeonggi Province (GEPIK) is the largest local jurisdiction in South Korea already exceeding Seoul with an annual population increase of 340,000 for the past five years. In addition, Gyeonggi Province (GEPIK) is located at the center of not only Korea, but the economic sphere of Northeast Asia as well which strengthens its position as a "Truly Global Gyeonggi Province." Gyeonggi Province (GEPIK) is located at the heart of the Korean peninsula. Geographically, it is situated between longitude 126?and 127?East and between latitude 36?and 38?North. It is bordered to the north by the 38th parallel, and the Yellow Sea to the west. Also, to the east it meets Gangwon Province, and it borders with Chungcheong Province to the south. In the center of Gyeonggi Province lies the capital city of South Korea, Seoul. GEPIK invites responsible, enthusiastic native speakers of English who will invest their time to enrich their lives and build a professional teaching career while sharing knowledge and culture with students and teachers of Korea. Successful applicants will be required to conduct English conversation classes for Korean primary and secondary school students as part of the Korean government's aim to promote and strengthen English language education. A candidate should have a strong sense of creativity and motivation as well as enjoy working with young children as part of an academic team. Successful applicants are expected to focus on the development of oral communication skills using interactive teaching methods. The term of the contract is for 52 weeks. The (Native English Teachers) NETs shall work 8 hours per day, 5 calendar days per week excluding Saturdays, Sundays and national holidays (approx. 14 days) of the Republic of Korea. The work hours of NETs may follow the normal work schedule of Korean teachers. Applicant must fill in GEPIK application including personal essay and self medical check form. Personal Essay must be more than 300 words and TEIK recommends that you write this essay briefly about why you would be an excellent teacher in the GEPIK program. Resume must be formal and appropriate for applying for a teaching job at a public school. Educational background and full time teaching experience must be clearly stated on your resume and your cover letter must be included. GEPIK applicants must have 3~4 years BA qualification or above and applicants must provide notarized (Apostilled) copy of BA and MA diploma. Officially Sealed Academic Transcripts must be provided and applicant must provide MA or Doctorate transcript as well (if it is applicable). We need three sealed transcripts because Korean immigration, the school and the Korean consulate are requesting applicant's transcripts. Photocopy of Passport needs to be submitted and it does not need to be notarized. Notarized by State Apostille, statewide criminal background check (any state is OK). Criminal record check only valid 6 months after it is issued. l Web Search Result of Criminal Record Checks are not accepted and CRCs must clearly state that "No Record" or "No record founded" on the statement. Canadians must get their CRC with venerable sector search from the RCMP or provincial Police department and they must have their CRC notarized by a public notary and the Korean consulate. Professional recommendation letters must be an original. Friends or close relatives cannot provide a reference letter, so an academic Professor(s) or employer(s) should issue these letters and the letters must be written or typed on a letter head and it must also include the contact information of the writer with the writer's signature. Certified teachers must provide a notarized copy of their teaching certification and Language certificate such as TEFL, TESOL or CELTA course must be more than 100 hours of classes and a minimum of 6 hours of practicum, otherwise it will not positively affect your salary level (certificate holders can raise their pay by 100,000KW on average). You need to prepare four passport photos because you will also need one after you arrive in South Korea for your alien registration card. You need to paste your one of your passport size photos on your application and also include 2 more with your application for immigration. TEIK will provide you a copy of the contract and you need to make three copies and you must initial every page before sending it to TEIK. Applicants must provide an official letter from their previous employer(s) in order to provide proof of an applicant's full-time previous teaching experience. A copy of a visa or a copy of a previous contract will not be accepted and the period of employment and "full-time employee" should be stated within the letter. l Only one full year of experience will be considered as full time teaching experience (for satisfying the better salary criteria requirement). The duties of the Native Speaker English Teacher (hereinafter "NSET") are carried out under the guidance of the supervisor designated by Gyeonggi English Program in Korea (hereinafter "GEPIK"). GEPIK will decide placements accordingly and participants will work at elementary and middle schools within Gyeonggido, but some may be designated to work at other educational facilities within the GEPIK system.